C.S. Giscombe is the author of books including Prairie Style, Two Sections from Practical Geography, Giscome Road, Here, At Large, Postcards, and Into and Out of Dislocation. Prairie Style was awarded an American Book Award by the Before Columbus Foundation; Giscome Road won the Carl Sandburg Prize, given by the Chicago Public Library. 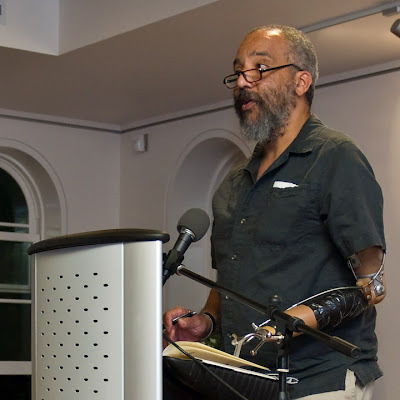 In 2010, Giscombe received the Stephen Henderson Award in Poetry from the African American Literature and Culture Society; he has been awarded fellowships from the National Endowment for the Arts and the Fund for Poetry. He is a member of the faculty at the University of California, Berkeley. Alex Runchman completed his PhD thesis, Europe is the Greatest Thing in North America: Delmore Schwartz’s “International Consciousness”, at Trinity College Dublin in October 2011. He is currently revising a manuscript to submit for monograph publication in Palgrave Macmillan’s ‘Modern and Contemporary American Poetry’ series. The research he is undertaking at the Beinecke Rare Books & Manuscript Library will help to consolidate the renewed claims he is making for Schwartz in this study. In addition to his work on Schwartz, Alex has contributed an essay on the epic to Blackwell-Wiley’s A Companion to Poetic Genre, a bibliographic essay on the Irish poet Pearse Hutchinson to a new collection of critical essays on his work, and an essay on John Berryman and Robert Lowell’s sonnets to After Thirty Falls: New Essays on John Berryman (ed. Philip Coleman and Philip MacGowan). He is currently writing an article on the Scottish poet Mick Imlah’s allusive practice. He is an associate lecturer at TCD, and also teaches and lectures at University College Dublin and the Mater Dei Institute, Dublin City University.